Lunchtimes are a very important part of the children’s day at Littleport Primary School. There are many activities and school clubs available and eating a tasty, healthy meal whilst relaxing and chatting to friends is a key part of the day. Children can choose to have a School Meal or bring a packed lunch. As a healthy school, we only allow children to drink water or milk so please ensure you provide a relevant drink for lunchtime and throughout the day. We have a 'Pupil Choice' Menu provided by Norse Catering. The red, green and blue options all include a choice of different puddings, seasonal vegetables, salad bar, freshly baked bread and fresh water. Why choose a school lunch? We have special meals throughout the year, and welcome parents to eat a school lunch with their child as well – details of events will be circulated a week or so beforehand. All KS1 pupils are entitled to a tasty, nutritious free school meal. The Government provides funding to enable primary schools in England to offer a free meal to every child in these year groups. 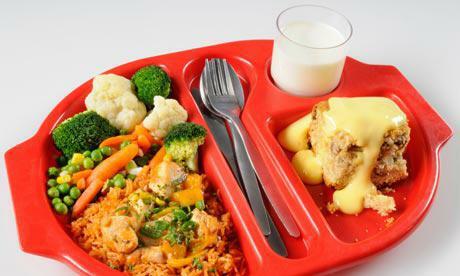 This is known as the ‘Universal Free School Meal’. Who is eligible for Free School Meals and Pupil Premium? Note: Families in receipt of Working Tax Credit are not eligible for Free School Meals and Pupil Premium. Even if your child is in Key Stage 1, (therefore is entitled to the Universal Free School Meal), please ensure you apply for Pupil Premium funding as this can be used for a range of interventions including: help with costs of school trips, music fees, teaching assistant staff, after school programmes, equipment as well as entitling you to help with uniform costs each term. At Littleport Primary we know how important it is that children have a healthy, balanced lunch. Our school dinners are a very healthy choice and the best way of ensuring your child has a good balanced meal but we know some families prefer their child to have a packed lunch - so we try to help you plan a fantastic lunchbox which your child will enjoy and is good for them. The eatwell plate highlights the different types of food that make up our diet, and shows the proportions we should eat them in to have a healthy, balanced diet. It's a good idea to try to get this balance right every day, but you don't need to do it at every meal. You might find it easier to get the balance right over a longer period, like a week. Try to choose options that are lower in salt when you can. Eating healthily is about eating the right amount of food for your energy needs. In England, most adults are either overweight or obese. This means many of us are eating more than we need, and should eat and drink fewer calories to lose weight. The menus attached below rotate on a 3 weekly basis.